Eventing Canada [!] is a not-for-profit organization established in 1996 to assist athletes in reaching their eventing goals. We are, of course, at www.eventingcanada.com. Eventing Canada[!] consists of a board of directors who volunteer their time to facilitate the organization's goals. Other organizations related to equestrian sport, but not associated with Eventing Canada[!] include Equine Canada and the Canadian Eventing Committee. Eventing Canada [!] was conceived in 1996 to be an independent promoter of the Sport of Eventing. to provide training and competitive opportunities for both Human and Equine Athletes in Eventing. The Eventing Canada [!] Directors believe that a Training Centre is a critical training opportunity. At a controlled, non-competitive venue, Eventing Athletes may train, school and clinic at a site specifically designed for clinics and lessons. Eventing Canada[!] have now re-opened the facility in 2006 in a new venue in Tottenham, ON, called Pommelé Acres. Pursuit of Excellence through organizing a series of clinics conducted by internationally renowned clinicians. Few other organizations, or facilities, would be concerned about whether they only "broke even" on a clinic series as Eventing Canada [!] offers. A Working Student Bursary Program is also a viable and valuable function for Eventing Canada [!] to pursue, whereby young, aspiring Athletes from across the Country can learn, with their Horses, and work for their tuition. An Event Riders Benevolent Fund to assist disadvantaged Athletes. 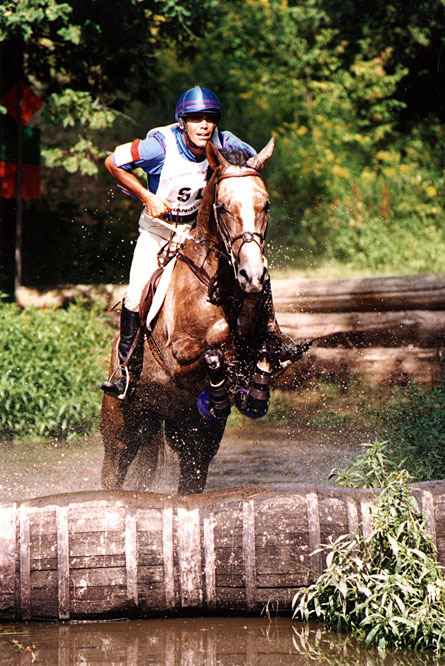 In 1997, Eventing Canada [!] established such a fund, and with the proceeds from "Ride for Riders" (plus donations from the Ambulance Service, Medstat, and the Caterer, A Taste of Class) we have invested over $8,000. with Regal Capital Planners to benefit those people who are deemed deserving. In 1999, one Athlete, Jennifer Thompson, was a recipient of funds as a result of her unfortunate accident. In 2001, Karen Brain was a recipient. In 2002 Chris Bennett was a recipient. In 2003 recipients included Leslie Grant , Karen Brain and Corry Boyd. Elite Athlete Support. Eventing Canada [!] plans to continue to support élite Athlete's competitive efforts at National and International competitions, to ensure that they have the opportunity to qualify and represent Canada to the best of their ability. Read more about our 2004 recipients. a) imagine (!) - In order to continue its role to fund Athletes to train and compete, Eventing Canada [!] hosts " imagine(! )", our infamous silent auction, running for over ten years. "imagine (!)" has raised over $120,000 to support our discipline since its inception in 1994. Always a gala not to be missed! b) The Eventing Canada [!] 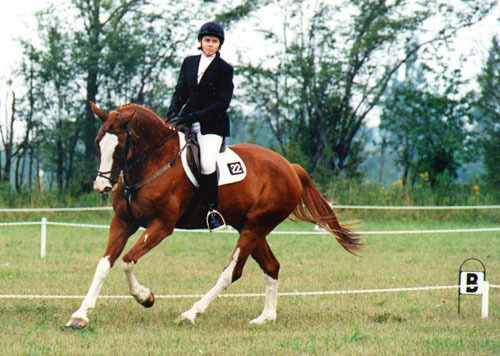 calendar - In November 1999, Eventing Canada[!] launched its first calendar featuring the Canadian stars and aspirants in our Sport. We are confident that the positive momentum which we garnered in its first year will build for the future. Due to the loss of our beloved friend Heather Wellman, who spearheaded this initiative, the calendar will no longer be available. c) Charitable Status - And finally, through Revenue Canada's recognition of Eventing Canada [!] as an Amateur Athletic Association (effective 12/01/98, our registration # is 88721 5275 RR0001) we can accept arms length (non-family) donations to support the training and competitive efforts of all Athletes in our Sport. A 5% (five per cent) fee will be withheld to cover administrative expenses, and the balance will be distributed to the designated Athlete, upon presentation of original invoices for legitimate, related expenses. The above are the ongoing plans for Eventing Canada [!] Its success is based on the energy and commitment of both the Volunteer Directors and YOU, the Eventing public. We invite you to Volunteer at our functions, attend our parties and clinics, and in truth, trust you will embrace the Association as being a positive, dynamic organization devoted to improving our Sport. All comments and suggestions (constructive only, please) are welcomed. To compete regularly you also need to join the provincial affiliated groups that govern equine activity and the sport of eventing in your area. You can find out more about these groups from the Equine Canada and Canadian Eventing Committee sites. You need to join Equine Canada, and purchase a horse license from them for each horse you wish to compete regularly at "Recognized" (Training level and up) horse trials in Canada. The Canadian Eventing Committee, formerly known as Horse Trials Canada, is the federal body governing the sport of Eventing in Canada. Their site is www.canadianeventing.com. They publish the Omnibus and set the dressage tests.